Here at TheSignChef, we've spent years developing all sorts of tools and technology to make your custom sign decisions smooth, simple and flawless. And we're not just a sign company, but we're a software company as well! Other sign companies actually lease software and e-commerce technology from us! -You can get professional looking sign designs for free, and in a way that is convenient for you! -Our whole staff can communicate better because we're always in the loop! -We can instantly track your current orders as well as orders from years past! This is just a taste of what our sign technology can do for you. Below find a complete list and description of all the nifty tricks and tools we've got hiding in our kitchen! This is our self-service design option, where you can create your own sign design anytime, and for free. With SignMagic, you can literally create your own design in minutes! SAVE feature enabled so you won't lose all your hard work! 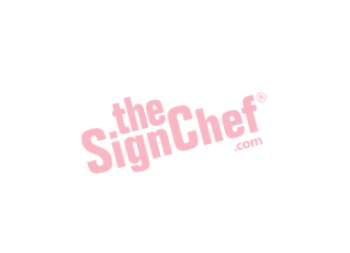 Designs are manually reviewed by TheSignChef to make sure your sign recipes are flawless! This is our full-service design option, where we'll design your sign for you (for free), even if you're 2,000 miles away! Live Design sessions are free, compliments of TheSignChef! There's absolutely no obligation to buy, ever! DataLoop is our very own software which has been developed and updated since 2003. It is a real-time order tracking system that allows us to provide customers with up-to-the-minute updates per their request. In short, DataLoop is an integrated internal and external communication tool for anyone in the custom sign making industry — it keeps everyone in the loop! We use DataLoop to document every aspect of every order from the moment the order is put into the system until after the customer receives it. Throughout the progress of each order, our client's file is constantly updated and time-stamped with the person's name who worked on it. Why is this important? Because now, anytime any customer inquiries about their order in any way, anyone you talk to here can give you an exact answer, without having to ask around before getting back to you! And that's not all! With DataLoop we can recall design information and order specifications years after your signage from TheSignChef was ordered. We can then remake your exact signs without you having to keep any of your own files! This one-of-a-kind tool will help you pinpoint the best type of sign material to use for your particular project. How does a small business manage hundreds of incoming and outgoing emails a day without going bananas?! Simple—Google-Powered Email! G-mail is perhaps the best email management system on the planet! With dynamic sorting, labeling and Google-powered search built right in, our in-house Customer Service Specialists can retrieve your correspondence with our company - on demand - within seconds. In short, G-mail's efficiency helps us maintain fast customer response times without chaos. Comparable enterprise-class email management systems can cost thousands of dollars and still not have all of the functionality and robust features G-mail offers for FREE, just for the asking! Google also offers a commercial version to small businesses for just $75 a year. The commercial version allows you to brand your email messages. For example, instead of having a free G-mail address like, our commercial G-mail account is branded specifically for our company — . While G-mail technically isn't "Our Technology", we view Google as a strategic partner in helping us serve our clients' needs faster and better than ever before. Our website is a live communication channel with our clients. If you've got questions but aren't quite ready to speak with one of our sign specialists on the phone, then take advantage of our Live Chat tool! With Live Chat, you can get live support by text typing with one of our real live customer service specialists, even after normal business hours. Sometimes, all you want is the bottom line! And "What does that price include?" This online pricing calculator will instantly show you prices, sizes, any quantity discounts, options and more! When designing your sign, it is important to know what size the letters on your custom signage should be so that it's readable from a distance. This handy Letter Sizing Calculator removes all the guesswork. Our videos are instructional, educational and entertaining, and are created so you can get to know us (and what we can do for you) a little better. Video delivers more information faster than we can explain in writing, and are great for those that prefer to absorb information visually and by listening rather than by reading. Our videos deliver new information and demonstrate sign making tools that you won't find anywhere else! And if you live 2,000 miles away, they are the next best thing to coming to our shop in person. Custom products cannot always be purchased on the spot through the internet. But at TheSignChef, that's not the case! We've designed all sorts of tools that allow you to conveniently place your custom signage directly into your shopping cart and purchase on the spot. You can actually buy a custom product at all hours of the day without talking to a single sign specialist! Our Online Shopping Cart is set up so that each purchase goes directly into DataLoop, our order tracking software. Therefore, since don't have to re-type any order information, any chance for human error is eliminated! And our shopping cart is protected with security encryption, making custom signage shopping not only convenient but safe! We piggy-back YouSendIt.com's FTP which allows our customers to send large image files that are too large for most email. We have two dedicated servers as well as system redundancy with off-site backup of all customer data and design files. This keeps all of your order history and file information intact so future re-orders are seamless and hassle-free. This server allows for ongoing site and software enhancements and upgrades without interruption of service. With the use of this server, we have been able to constantly make site improvements, de-bug, and develop our core technologies. We've created a proprietary vinyl application kit called Vinyl Magic. This kit includes an environmentally friendly deep cleaner that is instrumental in removing invisible contaminants prior to vinyl application. Additionally, our application fluid is an in-house recipe that we've been developing since 1988. It allows for a bubble-free application and doesn't leave a residue which can cause premature vinyl failure. Vinyl Magic also includes a special drying agent so that moisture can evaporate from behind the letter quicker. But beyond Vinyl Magic, our real secret ingredient is our specific vinyl application method that is explained in our fully illustrated directions included in each kit. Flatbed printers are a staple in the signage industry. However, not all flatbed printers are created equal. We knew investing in a top-of-the-line printer upfront would be well-worth it in the long run. There are five main components of the VK300D that give it a leading edge in the flatbed printer market. Revolutionary Kyocera printheads: A printhead is the part of the printer that disperses ink onto sign substrate to create an image. The Kyocera printhead fires at a groundbreaking 3.5 picoliter (one picoliter is one trillionth of a liter) dot at a native 600 dpi (dots per inch). In other words, it can print 600 microscopically small ink dots in one inch of space. This means that your sign is printed in extremely high resolution with clearer, crisper graphics, text, and photographs. Specialty ink: The VK300D uses specialty ink manufactured by Sun Chemical specifically for Kyocera printheads. This ink is formulated to be thinner than other printer inks so printheads do not clog. It adheres to the surface of your sign better than any other ink in the marketplace, and is more accurate in color from batch to batch. Sun Chemical uses a completely automated, computer-driven process to ensure there is no color shift between batches of the same color ink. Many other ink companies simply eyeball this process, which can lead to inconsistent color results from sign to sign. Vanguard Console: While it doesn’t have an obvious role in the creation of your sign, the console is still crucial in the printing process. The Vanguard Console allows for more customized setting specifications for each print job. It also reduces printing time so we’re able to produce more signs, more accurately in less time. Onyx RIP (Raster Image Processor): This is the software that generates the printed output from the art file for each individual sign. The Onyx brand leads the industry in the United States for RIP software. Its RIPs are easier to use, create more accurate color, print in higher resolution and provide an outstanding color gamut (or range of colors available). Your sign will have clearer images, more color variation and better accuracy between the initial design and the final sign. VK300D LED curing process: After the printing process is complete, the ink still has to dry. Traditional flatbed printers use UV bulbs. While these do the job drying the ink, they often get the sign so hot that the actual material may be damaged or warped. LED lights are able to cure the ink just as well with far less heat so there is no damage to the sign substrate. LEDs are eco-friendly, last longer and don’t contain mercury. For vinyl lettering, graphics, banners, and signs with a vinyl overlay, TheSignChef.com relies on the Seiko ColorPainter M-64s to produce superior signage. The M-64s is a wide format inkjet printer that allows for durable, long-lasting color and high-resolution images. The ColorPainter M-64s uses Eco Solvent SX ink, a low odor ink with exceptional outdoor durability and a wide color gamut. SX ink can produce high-density, rich colors and crisp details even in dark areas of the image. The Eco Solvent SX ink is certified for low chemical emissions, making for a better, healthier work environment. The M-64s uses Dynamic Dot Printing technology to optimize the size of the dots based on the image. With the ability to print up to 900 dpi, you don’t have to worry about your artwork looking blurry. This Dynamic Dot Printing technology produces bold, rich colors and crisp detail without any loss in printing speed. Smart Pass Technology is a set of algorithms and masking technologies that reduce graininess in halftone areas, creates smoother skin tones, reduces overspray and significantly cuts down on banding (sections of the material where there is an excess amount of ink). The M-64s even has technology built in to reduce printing defects caused by static electricity (a major problem in the sign industry). The On-Carriage Ionizer neutralizes static electricity on the vinyl, resulting in more consistent print quality no matter what the humidity level outside may be.